Topo50 Prototype - Legend Key. Maps use symbols to represent features on the ground. These include roads, tracks, rivers, lakes, vegetation, fences, buildings, power lines, etc. 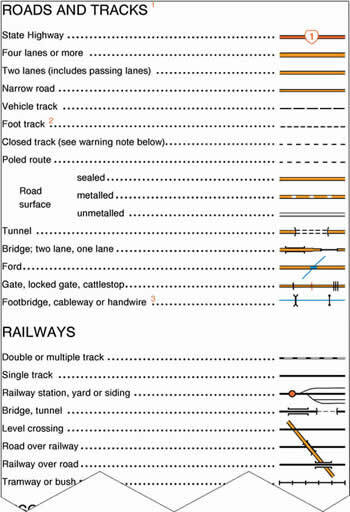 Symbols are grouped into themes on a map's legend key (eg "roads and tracks", "railways", "relief features"). Given it is not possible to represent every feature on the ground, different scale maps show different levels of information. Larger scale maps show more detail and a greater number of features. Colour plays an important part in symbols. For example, blue is used for water features, black for cultural features and green for vegetation features. Prototype Topo50 legend key. (Note: only part of the legend key is shown).